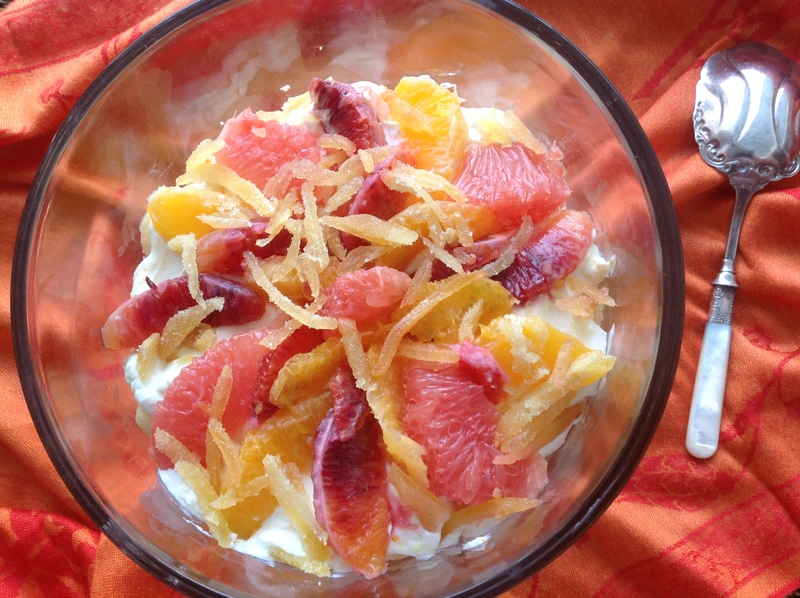 Beat the mascarpone cheese with the yogurt, honey and zest until smooth and fluffy. Cuts segments from the oranges and the grapefuit: slice the ends off the fruit so it sits flat on a cutting board. Slice off the peel and pith in long, vertical strips, following the curve of the fruit. Then working over a bowl, cut between the membranes to release the segments. Before discarding the membranes, squeeze them and collect the juices. Dip both sides of a third of the ladyfingers in the citrus juice. Let any excess drip off. You don’t want the cookies soggy. Arrange the cookies in the bottom of your trifle dish, breaking some as needed to fit in all spaces. Spread one third of the cheese mixture over the cookies. I found it easiest to scoop it out in 5 dollops, 4 along the sides and 1 in the middle, then spread gently with a spatula as best as possible. Sprinkle one third of the ginger over the cheese then arrange one third of the citrus on top of the ginger, alternating the grapefuit with the orange. Repeat two more times. For the final layer, place the ginger over the fruit. Refrigerate at least 6 hours or overnight. Let stand at room temperature 15 minutes before serving. 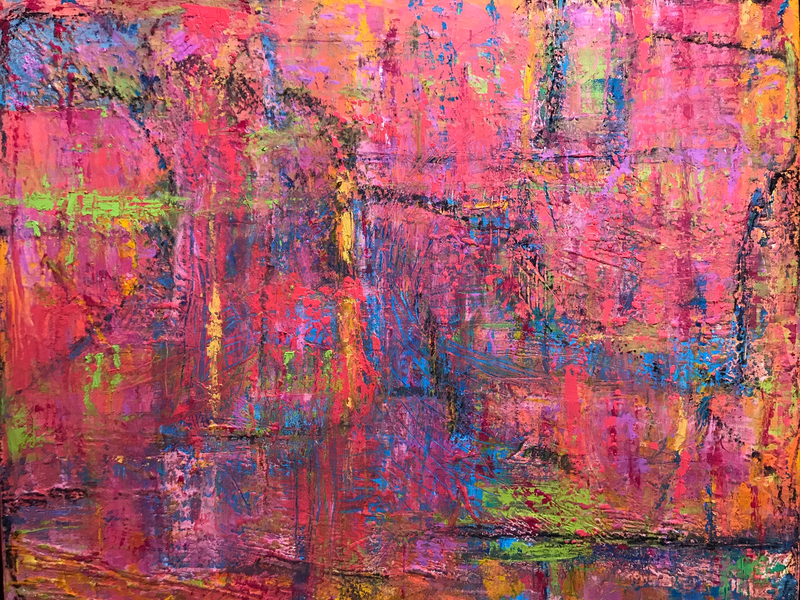 Razzle Dazzle, one of my paintings that I think perfectly captures the explosion of bright flavors of this dessert! Oil/cold wax on canvas. 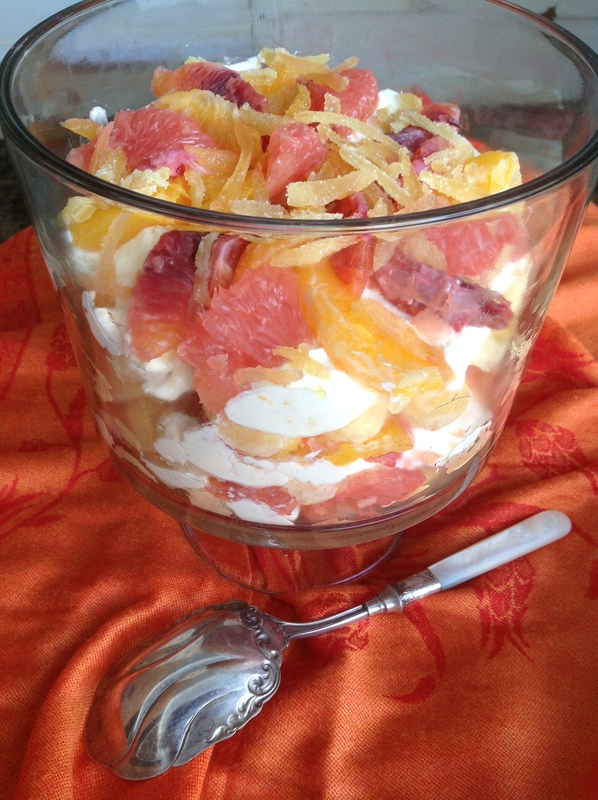 This entry was posted in Recipes and tagged ginger citrus trifle, healthy trifle with yogurt, winter citrus trifle, winter trifle, yogurt citrus trifle by Johanne Lamarche. Bookmark the permalink.